As the sister brand to Crane & Co.—a company that has been in business since 1801—we know the value of trust in our name. Just as our retailers trust the product we produce, our retailers’ brides and grooms trust that they are getting the best advice and care during one of the most important times of their lives. So it’s no wonder that when Caroline and Wes were ready to choose their wedding invitations, they went with Gem Printing. 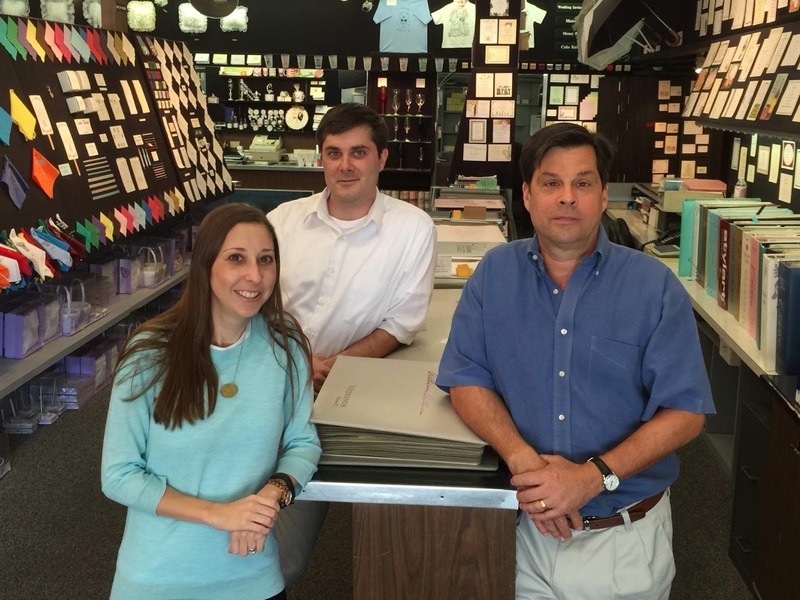 A family-owned business since the early 1900s, fourth generation employee Melissa Cousans Mortillaro had this to say about the New Orleans institution: “Gem Printing is run by me, my brother Tommy Cousans, my father, Sidney Cousans III, and my uncle, Dennis Cousans. We have been is business in since 1918. The year New Orleans turns 300, we'll be 100! Wesley and I were both born and raised in New Orleans. We didn’t know each other until 2010 when we met through mutual friends. Our relationship was strictly friendly at first, and then we began dating in the spring of 2011. After years together, and knowing that we wanted to eventually get married, we decided to buy a house. This was in October 2014. The house was outdated and had some Hurricane Katrina damage, so we decided to completely gut it and do a full renovation. On December 23, 2014, he told me that he had some friends in town from New York and that we were meeting them for dinner, but that we had to stop by the new house first to pick out some baseboard colors. I found this a little suspicious because the “friends who were in town” had already been in town recently, and I had already picked out the baseboard colors! Ha! When we walked into the house, he had set up lovely tea light candles and had red roses shaped in a huge heart in the middle of the floor. 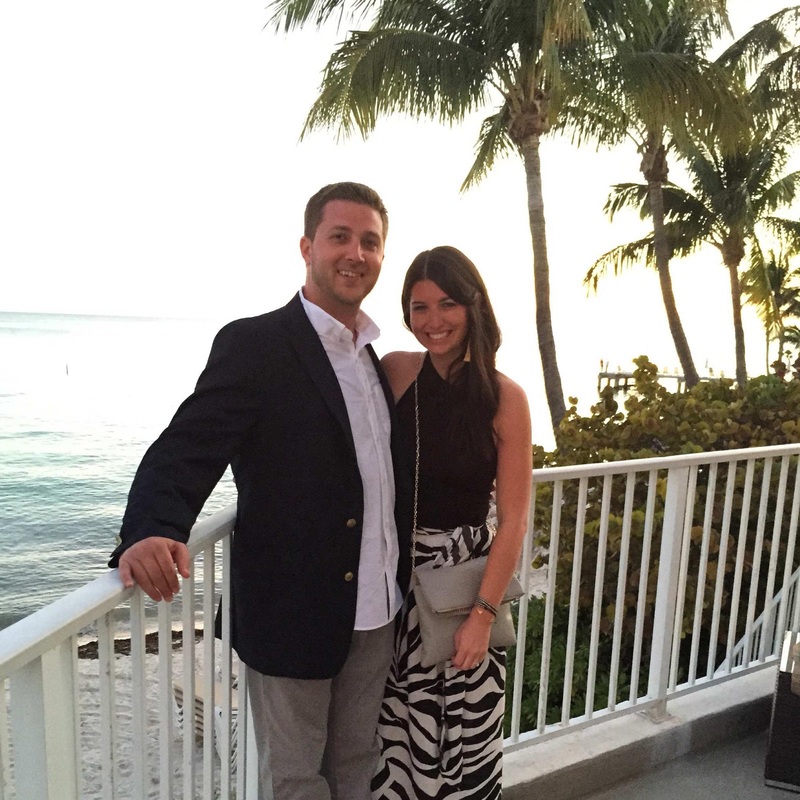 It was so romantic, even in our gutted construction zone! He got down on one knee, and I just remember hugging him and crying—I don’t even recall saying, “Yes”! It was the most perfect engagement that I could have asked for—private, romantic, and sentimental. My sister’s good friend recommended Gem printing. It has been family owned and operated in the greater New Orleans area since 1918, so it has been around forever and they offer beautiful things! I had no clue what I wanted detail or design wise, but I knew I wanted something simple and classic—I actually think that was my exact quote when I walked into Gem. We are getting married outside by an old fountain, so I wanted to incorporate the perfect mix of formal and informal into my invitation design. I did not want a wedding invite that one would use when they are getting married in a fancy cathedral—I wanted it to reflect our wedding and us—casual and laid back, but also classy and chic. As I was looking through the multiple albums of William Arthur invitations, one in particular immediately caught my eye. If you know me well enough, once I think something looks good, I’m sold. The invite was a mix of scripted font and printed font. I honestly did not think that I would have fallen in love with the idea of mixing script and print, but I absolutely loved it! For the first proof that we did, I had Gem put only my and Wes’s names in script. The rest of the invitation remained in print. When the email proof came over, I remembered opening it and thinking “oh – that’s it?” I called my mom instantly and told her that I just wasn’t feeling it. My mom went to Gem immediately and began discussing other options with Melissa (she’s great to work with!) When I got off of work that day, I met my mom at Gem, and I remember walking in and expressing my concerns to Tommy (who ended up helping us that day—he’s fantastic, too!). Tommy looked at me and took the words right out of my mouth by saying, “it’s too boring.” At that time, Tommy suggested that we script more of the wording to balance it out and to add some elegance. When the final proof came over via email, I was ecstatic. I called my mom immediately and said, “This is it. This is the one. I can feel it.” I fell in love with the design because it was exactly what I envisioned to reflect our wedding style—a great mix of formal and informal as well as classic and elegant. 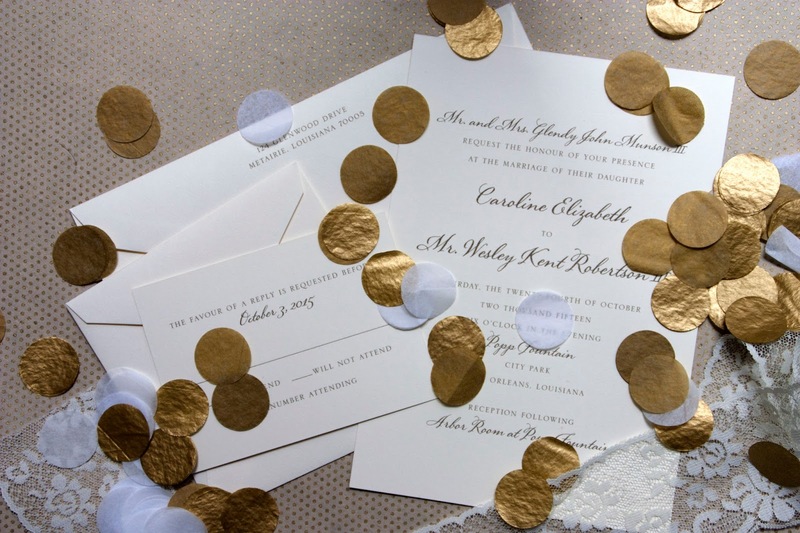 Was there anything about the process of choosing your invitations you weren't expecting? Honestly, no. It’s probably because I really had no idea of the process beforehand. Also, Gem was so awesome to work with that they made everything so simple and easy. I was shocked at how fast the turnaround time was, too! Go in with an open mind because you never know what you may end up liking. Caroline came in on a busy Saturday along with her mother. They were both very sweet and bubbly. She wanted something simple and traditional, yet something that reflected her personality. Tommy (my brother) helped them write up the order and I remember overhearing her mother say that she was so excited that Caroline was happily making decisions. They were very sweet and had a good time picking out the details. Caroline did make some changes to her initial proof, but loved the final outcome. The first question we always ask is, “What is the date of your function?” New Orleans is a city with a “Laissez Faire” attitude, meaning we are a bunch of procrastinators. Gem Printing has been in my family for more than 95 years (yes, I’m fourth generation) and we know that reliability and deadlines are all too important. William Arthur has yet to let us down. Vintage and rustic themes are very big right now, but in New Orleans, the Fleur de Lis is king. Bride’s love to incorporate the symbol into parts of their weddings, be it on the invitation, their favors or décor at the reception. Always go to a reliable retailer. We’ve been around since 1918, so we’ve seen our fair share of stores go in and out of business. Experience is something you need to have in order to walk a bride through the ordering process. There are a lot of choices to be made (wording, ink, envelope liners, etc.) and having a trusted and knowledgeable sales person is key to making the process a smooth one. I find that today’s brides are more educated about the different printing processes. They know the difference between thermography, letterpress and engraving. They care about the thickness and quality of the paper. Typesetting is super important to them. Brides really love sending out an invitation that sets a tone and gets the guests excited for the wedding. Are you a stationer or bride with a William Arthur wedding invitation you'd like to have featured on Real Weddings? Email us at concierge@crane.com!